"But when the third... gets killed, and all three of them in the same territory, I begin to get suspicious." Jakob van Schevichaven (1866-1935) is considered here to be the first professional Dutch mystery writer, under the single-name pseudonym "Ivans," who paved the way for later popular writers such as "Havank" and A.C. Baantjer. I've read and heard about the Fathers of Dutch Crime Fiction, Ivans and Havank, but never got around to reading any of their detective stories, because there's mainly biographical information on the web – while the available plot summaries tend to be vague, unappealing or spoiler ridden. So I never gave them to good old college try. Well, recently, I found a copy of De bosgeest (The Forest Spirit, 1926) on my shelves and thought: why not. It has to happen sometime. Book has a ton of these illustrations! Ivans' series characters are a well know, celebrated English detective, named Geoffrey "G.G." Gill, and a Dutch lawyer, Willem Hendriks, who has been chronicling his cases since De man uit Frankrijk (The Man from France, 1917). Gill and Hendriks were obviously cast from the same mold as Sherlock Holmes and Dr. John Watson, but, interestingly, Hendriks was presented as a more developed, individual character while G.G. 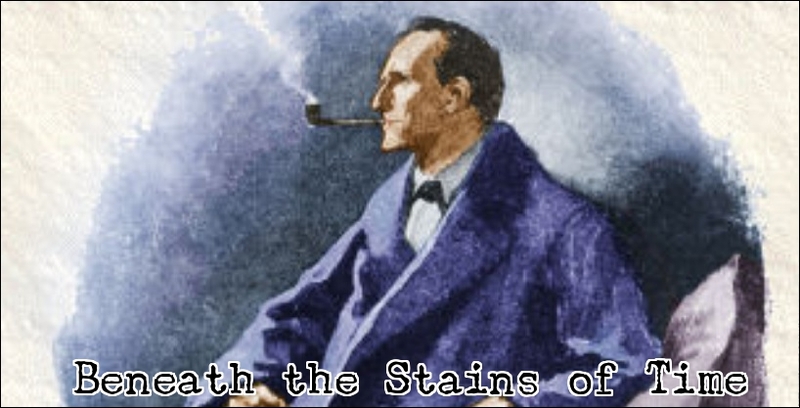 acted more as one of the stereotypical, lower-ranking Rivals of Sherlock Holmes, i.e. Martin Hewitt. 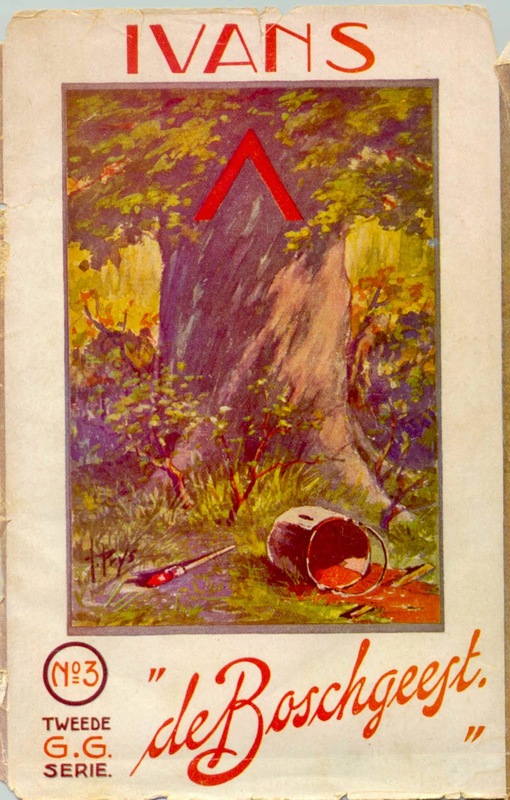 The Forest Spirit was originally published in 1926, but Hendriks informs the reader the story took place several years before The Great War (i.e. First World War) and began with a telegram from G.G. announcing his arrival the next day. G.G. invites Hendriks, alongside with his family (wife and daughter), on a trip to the Eifel (Germany) where they soak up the landscape of hill-and low mountain tops, ruins of medieval strongholds, circle-shaped lakes (maar) and lots of green – even the rude, inhospitable locals can't dampen the mood. The problems begin when a mistake, made at the hotel they booked, forced them to take refuge in a familiepension (hostel). Hendriks wakes up in the middle of the night to see a dark form with yellow/green eyes peering at him through the open bedroom window, but, naturally, there was nothing to be found upon investigation. The next day, during one of their daily hikes, G.G. and Hendriks, see a frightened road worker running and screaming "murder" and "bosgeest," which leads them to the body of a forest ranger and he wasn't the first one to be murdered in the region. Previously, three forest rangers have been murdered, back of their heads caved in, but the police have never been able to find any trace of the murderer. In the last case, the victim was found by following his footsteps, it had rained just before, but they were also the only footprints discovered on the scene – fanning the flames of superstition. Amazingly, the impossible situation of the footprints is mentioned only once and the problem explained itself in the end, which became a slight disappointment as I read on. No theorizing? False solutions? Boo! Seasoned mystery readers familiar with the early classics will probably experience an "aha" moment at this point, but, first, I have to credit Ivans here for not blatantly copying Edgar Allan Poe or Sir Arthur Conan Doyle. It was also a good idea to split the interest for the only real suspect in the game in two camps: the official police, who think he's guilty, while G.G. is convinced he's afraid of the spirit. I was never quite sure if I was on the right track, even though I picked up on an obscure clue, which is what I liked. What I don't like, however, is that I still don't know if I like The Forest Spirit. Ivans went full "Weird Menace" with the solution, and I grunted when it was confirmed, but the explanation is unsettlingly convincing and the motive has a lot to do with it. That, and the villain of the story. Mary Gregor from Anthony Wynne's The Silver Scale Mystery (1931) and Mr. Ratchett from Agatha Christie's The Murder on the Orient Express (1935) were saints compared to this character! So, yeah, I'm divided on The Forest Spirit, which began as a mysterious travelogue set in Caspar David Friedrich Der Wanderer über dem Nebelmeer (Wanderer Above the Mist), merging into Holmesian-era detective story and ending on an unsettling weird note... but I can't get pass the how of the murders. I don't think I like it, but than again, I'm probably too traditional minded for the alternative crime novel. That is John's department. P.S. : Good news for the non-Dutch readers of this blog. According to this website, there have been translations of some G.G. novels in English, German, Swedish, Norwegian and Esperanto. "A fairy tale in terms of blood--a world in anamorphosis--a perversion of all rationality... It's unthinkable, senseless, like black magic and sorcery and thaumaturgy. It's downright demented." Well, I told you the next review wouldn't take another month to appear, didn't I? O ye, of little faith! However, I did found myself in a spot of trouble in finding my next read, because I'm still waiting for a package to arrive. So I was forced to climb Mt. To-be-Read to pick something from the old stack of unread detective stories, which became surprisingly easier when I decided it had to be something obscure and The Monk of Hambleton (1928) seemed to fit that description. The Monk of Hambleton was penned by Armstrong Livingston, who's apparently one of those mystery writers too obscure for even the GADWiki, but the capsule-biography in front of the book notes that the author was born in New York City, made his home in Algiers with his wife and began writing in 1918 – which resulted in such novels as The Mystery of the Twin Rubies (1922), Trackless Death (1930) and the (now) ambiguously titled Light-Fingered Ladies (1927?). I have Trackless Death jotted down on my never-ending wishlist, because Robert Adey has it listed in Locked Room Murders and Other Impossible Crimes (1991), but The Monk of Hambleton is my first, favorable exposure to Armstrong Livingston's work. 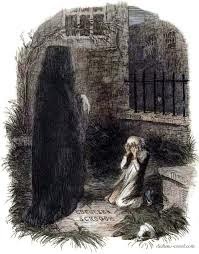 The best way to describe the story is Charles Dickens' A Christmas Carol (1843) as perceived by Sir Arthur Conan Doyle with a pinch of Scooby Doo. There's even a young, female investigative operative, named Kitty Doyle, who plays the Miss Climpson to Peter Creighton's Lord Peter Wimsey in the endgame of the story. But that’s skipping ahead of the story. Varr & Bolt Tannery occupies a couple acres of ground nearby the village of Hambleton and while the weather-beaten, shabby looking buildings of the leather plant may give the appearance of a neglected company, it's actually a thriving business – under the harsh, unrelenting rule of Simon Varr. The opening of the story mentions that it's said of Varr that "he knew how to exact the last ounce of efficiency from men and material without the expenditure of a single superfluous penny," but a strike has brought his efficient machine to a grounding halt. On top of that, Jason Bolt, "a minor partner in the business," is suffering from expansionism and his son, Copley, wants to marry the daughter of the tannery's manager, Mr. Graham – who, in turn, finally wants to be a partner instead of drawing a regular salary. However, Varr is determined to bend everyone and every situation to his will, including a radical end to the strike, but it seems the universe itself has turned against Varr: his kitchen garden is raided, the first love of his wife, Leslie Sherwood, unexpectedly returns to the village, as did his wife's sister, October "Ocky" Copley, after spending twenty odd years in Asia followed by arson and theft! Varr's stalwart determination is really tested after a late-evening encounter with the legendary and titular monk of the village – who points an accusing finger like the Ghost of Christmas Yet to Come. Shall rue the day he was born. Woe goes with him on his way. Within a fortnight he shall die." It's simply a play on the Irish Banshee legend, but fun nonetheless, especially in a detective story! Simon Varr didn't fare as well in this story as Ebenezer Scrooge did in his, because he simply couldn't catch a hint, and the spectral monk strikes him down in his kitchen garden with an old, Persian-inscribed dagger – reading "I Bring Peace." This scene was delightfully old-fashioned, second-tier stuff, in which Varr dramatically removed the mask in a "What? You!" moment right before being stabbed. So cheesy. Peter Creighton is a reputable private investigator from the Big City, who was supposed to come, anyway, to investigate the arsons at the tannery, thefts and the ghost, but now has a fresh murder on his hands. I think Livingston purposely made Creighton the exact opposite of his more famous colleague of the time, Philo Vance. Creighton is a modest, nondescript professional instead of a posh dilettante with an intimate knowledge of obscure subjects, which Livingston made a point of by making Creighton say he couldn't read Persian. You just know if this had been Van Dine's The Strike Murder Case, Vance would've revealed himself as an amateur expert on the ancient Persian Empire often consulted by genuine historical authorities on the subject. It would've also been his most terrifying and challenging murder case since triumphantly ending the previous one. Anyhow, Creighton's woolgathering technique gathers more tangible clues such as the chips of blue steel, finger prints, written notes, shadowing witnesses and the implications of the shallow footprints concerning a small educated man or a large illiterate one. A nice dash of Chesterton, I think! And nice would be a good summarization of The Monk of Hambleton. Livingston has a nice, pleasant, albeit dated, writing style suiting the backdrop of a now bygone era, but the plotting was still (partly) in a previous era – making it not all that difficult to anticipate the eventual ending for the seasoned mystery reader. The normally clichéd ending of the dying murderer/confession was handled better that I could've hoped for. So there's that. In closing, The Monk of Hableton is a better-than-average, second-tier mystery novel from a period that didn't count the most prosperous years of the Golden Age in its decade, but this book definitely was a sign of things to come. (I consider the 20s as the start-up years with the 30-and 40s as the Golden Decades and winding down in the 50s). I know, I know. I promised in my previous post activity would slowly resume, which was a month ago, but, naturally, there was another distraction followed by a slight case of reader-and writers block – preventing even some filler stuff from being posted. So no definite promises, this time around, but this was hopefully the last of the prolonged silences haunting this blog. The Bone is Pointed (1938) is the sixth in a series of Australian-set detective novels featuring Detective-Inspector Napoleon "Bony" Bonaparte of the Queensland Police by the English-born mystery writer Arthur W. Upfield. Bony is of mixed blood, a "half-caste," which wasn't as common or accepted back in Upfield's time as it's today, but Bony is presented as a hardworking, intelligent and determined policeman – who moved up the ranks by combining his education with his Aboriginal tracking skills. The cover blurb of The Bone is Pointed, "the outback's weirdest manhunt," surely promised a more thriller-oriented outing for Bony, but the crux of the problem is that the hunter is being hunted while searching for a missing stockman. Jeff Anderson is a stockman on the Karwir Station, owned by Old Lacy and his wife, who went missing when checking fences during a heavy rainstorm, but only his horse, The Black Emperor, came back – which could’ve meant he was thrown off by the animal. However, they are unable to find the body and there's no shortage of motives for foul play. Anderson was known as a spiteful, cruel and ill-tempered creature who may have seriously mistreated members of the Kalchut tribe. Kalchuts are a small tribe of less than a hundred Aboriginals living the tradition lifestyle of the old continent on the neighboring property of Karwir Station, which is owned by the Gordons and they're determined to protect the Kalchuts from the encroaching Western civilization. If they murdered and hidden Anderson, it would certainly mean government interference and the end of the Kalchuts. The relation between the Kalchuts, the crime and their impending doom, if implicated in the crime, reminded me of the relationship between the primitive Marshmen and the ruling class of a fictional sultanate in Peter Dickinson's The Poison Oracle (1974). Anyhow, the case remains unsolved for months and it would've slipped through the cracks of time if it weren't for Sergeant Blake calling in a higher up – DI Napoleon Bonaparte of the Queensland Police. The trail is several month's old when Bony arrives on the scene, but through observation, interviewing witnesses and analyzing physical evidence Bony is slowly, but surely, retracing the steps of the missing stockman. But that's the easy part. As a half-caste, Bony dresses and speaks like a white man, but this case confronts him that he isn't immune to the believes of his Aboriginal side. Kalchuts are known with the ancient and potent magic of bone pointing, which curses its victim to the unwanted comforts of an early grave. 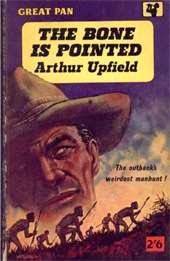 Unfortunately, the combination of Aboriginal folklore and Upfield's uncanny talent for turning the Australian continent in a living, breathing character of its own somewhat failed to produce the story it should've been, because I was giggling (immaturely) every time someone asked Bony if he was still being boned by the blacks. Or tried to banish the boning from his mind. There was so much forced boning that there must've been blood in his shoes by the end of the book. Leave him alone already. No means no! So aside from my complete inability to take the cultural slice Upfield offered in The Bone is Pointed as a mature-minded adult, everything worked out well enough in the end with a good, simple, but inevitable, conclusion. Cake in the Hat Box (1954) is still my favorite, from only the handful of Bony novels I have read, but that Upfield is grossly underrated and criminally neglected as a mystery writer is something I'm starting to become convinced of. Finally, I'll really make an effort this time to make sure this review doesn't become a drawn-out euphemisms for "see y'all next month."